DURING SUMMER MONTHS OR IF YOU LIVE IN A HOT CLIMATE, THIS PRODUCT IS ALMOST GUARANTEED TO MELT IN-TRANSIT. PLEASE CHOOSE OUR SUMMER SHIPPING OPTION DURING TRANSIT TO HELP DELAY THIS OR ONLY ORDER PRODUCTS LIKE THIS DURING COOLER MONTHS. WE ARE NOT RESPONSIBLE FOR MELTED PRODUCTS. 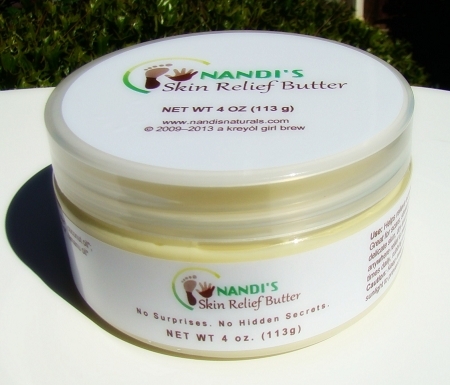 Nandi’s Skin Relief Butter helps protect and soothe skin affected by eczema, psoriasis and a multitude of skin conditions. This unscented blend is great for scars, sun- and wind-damaged skin, stretch marks, pregnant bellies, feet-and-heel resuscitation and baby’s sensitive skin. Many have used it for the discoloration and excessively dry skin developed following chemo and radiation treatments. It will also soften and smooth dry, flaky, discolored elbows. 4-11 for hard, crusty, peeling heels and feet: Just before bedtime, massage relief butter into feet and don a pair of socks. Used as a nightly ritual over the course of a few weeks, you should see a significant difference. Ingredients: mango butter, coconut oil*, cocoa butter*, beeswax, sunflower oil*, jojoba seed oil*, avocado oil*. Caution and Shipping Note: To maintain the whipped consistency of this product it is recommended that it be kept out of extreme heat or direct sunlight. Shipping of this product during summer months may result in melting or separation, therefore we are unable to guarantee the condition of whipped products upon delivery. Melting will not diminish effectiveness. I agree with Sheron! I use this on my daughter’s skin. She has eczema and I have to say that her skin immediately felt softer! Seriously. Not just saying it! I changed her clothes a couple of hours later and noticed that her legs were still nicely moisturized. I guess we can toss this Aquaphor out the door! :) We will definitely be some loyal customers of Nandi’s Naturals! Bye, bye, Carol’s Daughter. Hello, Nandi’s Naturals! I LOVE the Skin Relief Butter with (light) lavender scent. I feel and smell GREAT right now! I really like the way it rubs on like a cream, then the oils soak into my skin, providing long-lasting moisture. I’m extremely proud of you and your business endeavors, Nandi. Thanks again for mixing this formula. It’s exactly what I needed to soothe my eczema woes. This is a great product! I primarily started using this for my feet, then I used it all over my body. I never thought I'd like something better than shea butter, but this is it. I have to hide the jar, because my entire family uses it up! This is great for all kinds of applications. It feels very therapeutic and has made my face and skin healthier and feeling great. Definitely a must have. 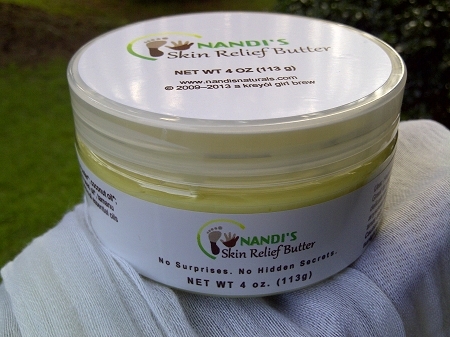 I started using Nandi's Skin Relief butter this past winter, which was one of the coldest in recent memory. This Skin relief butter has saved my skin from being dry, irritated, and itchy. Currently for the summer, I'm using some of her fabulous whipped body butters, but I am keeping this one in my arsenal for this coming winter. My daughter's skin loves this butter. She has really sensitive and dry skin. Since I started using this on her, her skin has improved drastically. Something not even medicated creams have achieved. We love it! By the way she is 2 if you're concerned about age and tolerance.